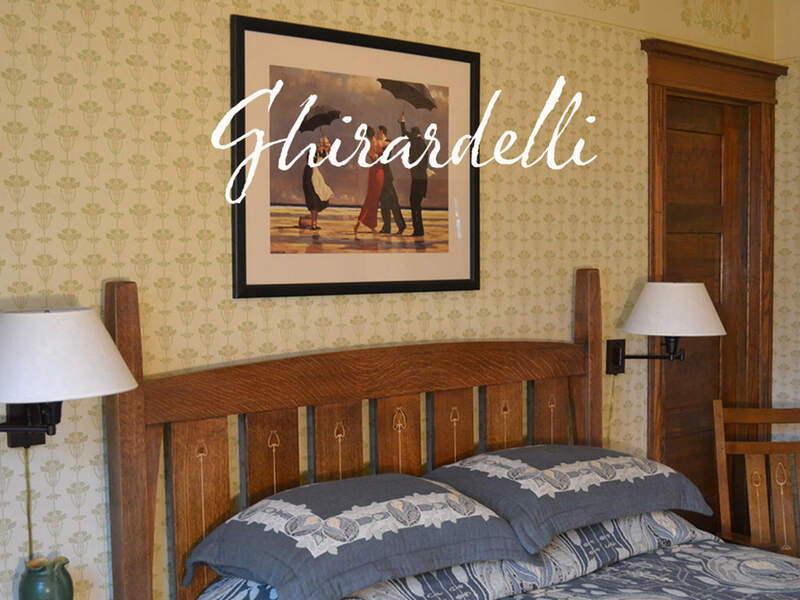 If you love chocolate, Cocoa Cottage Bed and Breakfast in Whitehall is the place for you. Awarded multiple Best Breakfast & Best Innkeeper awards, the historically restored 1912 Arts and Crafts bungalow features CHOCOLATE! From the chocolate decadence at check-in to hot fudge, fresh strawberries and chocolate bread in the morning, even the most serious chocoholics have not been disappointed. A Cocoa Cottage B&B is a beacon for those looking for simplicity in a setting of natural beauty. 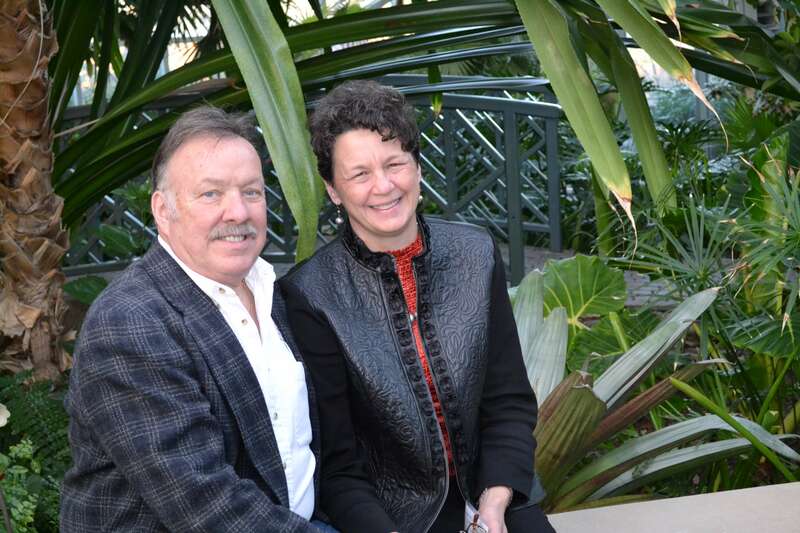 Escape to the heart of peaceful West Michigan and expect a warm welcome from Larry and Lisa. Rooms feature full private baths, TV-DVD, queen or king pillow-top mattresses, WiFi, central A-C, expansive library and of course, chocolate. Our focus is simple: Be passionate about what we do and do it well! 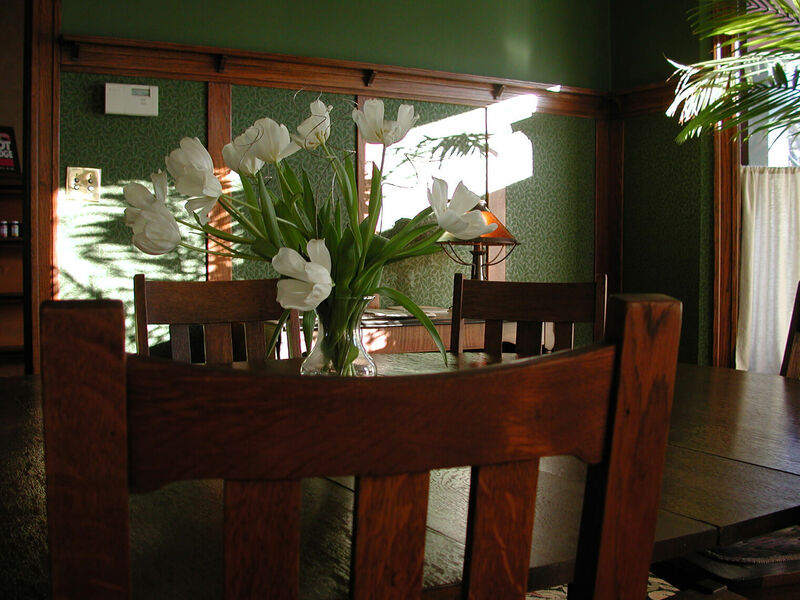 We provide a perfect place to celebrate and relax, or allow a business traveler to regain energy. The lovingly restored 1912 Arts & Crafts bungalow is an architectural breath of fresh air. Quiet, refined character, tasteful decor and impeccable attention to detail take you back in time when life had simple elegance and a relaxed quality seldom enjoyed today. Unwind by our cozy fireplace after a brisk day at the Muskegon Winter Sports Complex, or on our sun-dappled screened porch after 18 holes at Old Channel Trail. Muskegon County boasts of nearly as many golf courses as they do marinas and public beaches. Cruz'In Antique Car Show, Summer Celebration, Pumpkin Roll down Dowling Hill or the Blueberry Festival are just a few of the many festivals and events you can enjoy. 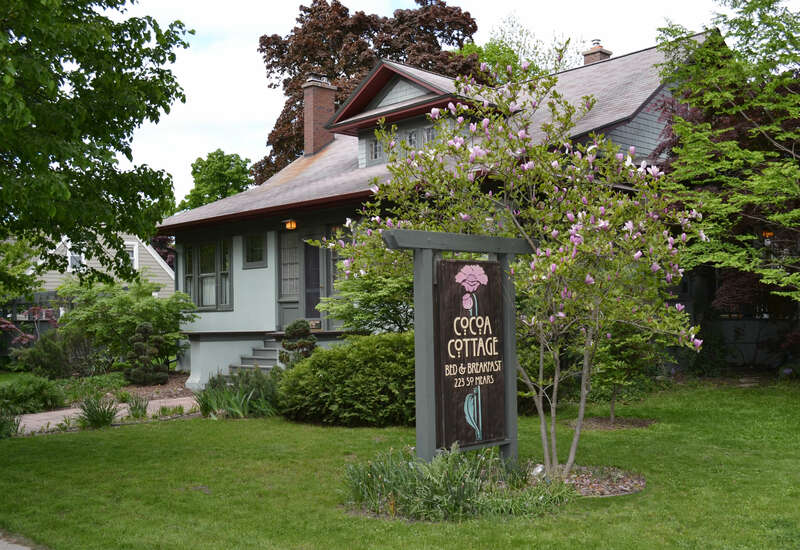 Cocoa Cottage B&B is just minutes to Lake Michigan's white-sand beaches, one block to the 24-mile, paved Hart-Montague bike trail and the Arts Council of White Lake's sculpture trail, and adjacent to the Historic Howmet Playhouse. Spend your day viewing the authentically restored Victorian treasurers of the Hackley and Hume Homes or Frank Lloyd Wright's Meyer May House. Whitehall-Montague is a very walk-able community. Within two blocks, experience shopping at the Hokey Pokey home decor consignments shop, Posh, an upscale women's clothing boutique, Pitkin's Drug and Gift Shoppe, the General Store fabrics and gifts, and satisfy your soul at the The Arts Council's White River Gallery store. Then just stroll over the bridge to Montague and grab a coffee and a book at the Book Nook and Java Shoppe, take in a class at White River Yoga, find a long sought treasure at the Montague Antique Mall. Don't forget to pick up some of Beth's yummy scones at our friend Beth I's Pies! Within walking distance from the Cocoa Cottage Bed and Breakfast are several quaint dining options. Enjoy lunch or dinner on the shore of White Lake at Crosswinds or overlooking the marina from Lake's Edge; Step back in time at Lipka's, an authentic old fashioned soda fountain and some of the best, most unique soups and sandwiches in town, while Pekadill's offers the best in hand packed ice cream. Bone Ends got their start as a local food truck. Based on popular demand, they now have a full restaurant with an expanded menu. Your in-room concierge book will guide you through all the local restaurant menus. Share laughs during our welcome reception of wine and chocolate. Discover something unique and wonderful while strolling around the gardens or shopping in downtown Whitehall and Montague. 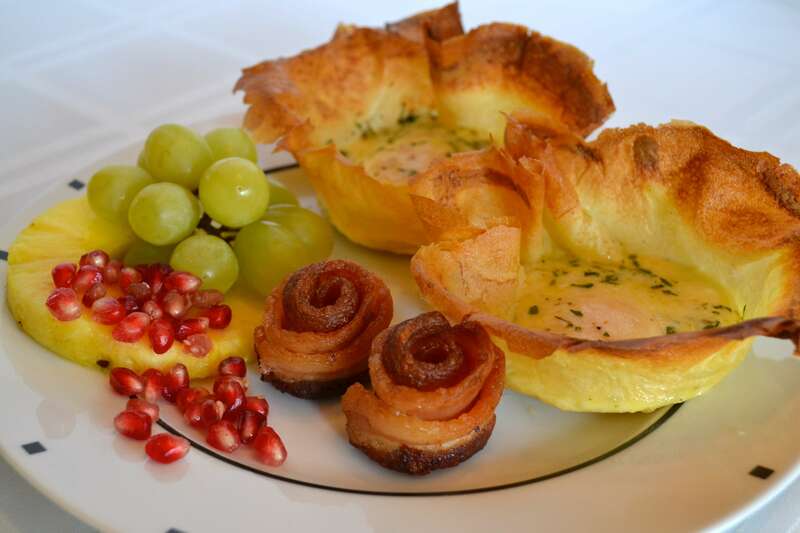 No matter the season, awake to one of Larry's sumptuous award-winning breakfasts of Cottage Eggs, or Lemon Ricotta Pancakes with fresh organic blackberries, or Salsa Souffle. Chocolate bread, Hot Fudge & fresh strawberries are enjoyed every morning. We are the perfect venue to unleash new thinking and ideas from your staff by hosting a corporate retreat at a Cocoa Cottage B&B. A professional, confidential setting catering to the business guest by white-collar dropouts who understand the needs of today's business traveler. Our rates are neither the highest nor lowest in West MI, but represent excellent value for the quality of our accommodations, service and cuisine. 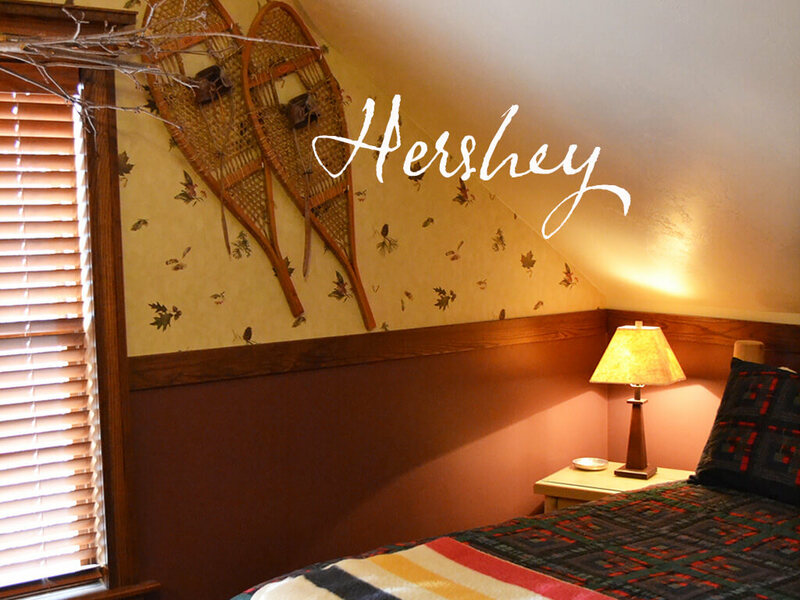 A stay at the Cocoa Cottage will exceed your expectations. 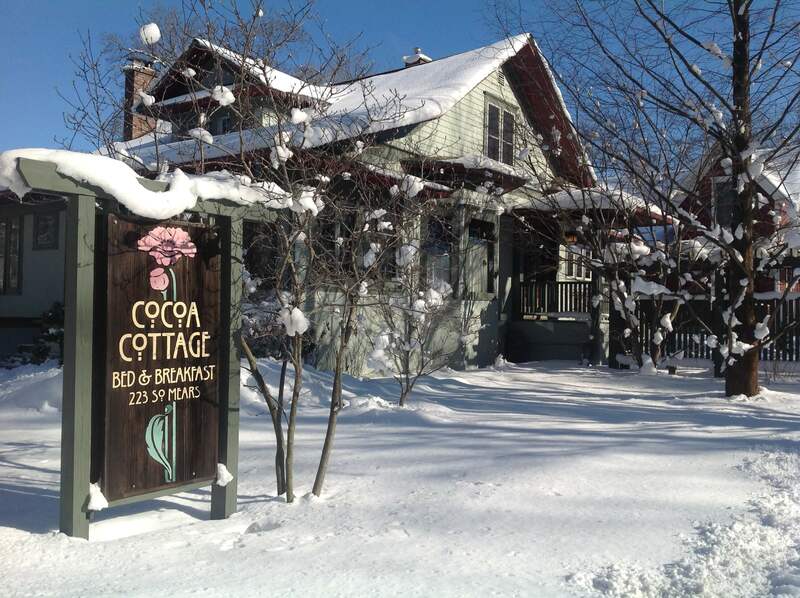 Visit Cocoa Cottage Bed and Breakfast soon, where life is better with CHOCOLATE! As beautiful as the White Lake area is in the summer, the stunning winter splendor and outdoor fun are extraordinary. A winter’s walk on the beach is one of the most serene, calming experiences we can recommend. The peace, the quiet and the beauty add up to a meditative experience you can’t realize anywhere else. When we seek more exhilarating experiences, the Muskegon Winter Sport Complex, just 10 miles south, is the place to go, day or night. Cross-country ski the longest, lighted trail in the Midwest. 10 miles of groomed trails that wind over the dunes and through the woods. There is also snowshoeing, ice-skating, sledding and the Olympic luge track! One of only four tracks that exist in the USA. Check out our MWSC 2018 Special Offer! After your refreshing day in the snow, return to the warmth of the Cocoa Cottage and snuggle up to a warm fire and a mug of hot chocolate! Two blocks from the Cocoa Cottage Bed and Breakfast is Fetch Brewing Company, a unique craft brewery located in the historic State Bank building. Their beer menu changes frequently and always offers something wonderful and unique! Within a short drive south, you'll find Pigeon Hill Brewery and the Unruly Brewery Company in downtown Muskegon. Just to the north is the Big Hart Brewing Company, which has a full menu of great dining choices. If your plans include Fetch, Unruly or Pigeon Hill Breweries, with advance notice, the Cocoa Cottage can prepare an awesome picnic basket for you. West Michigan has been known for centuries for its beautiful sugar-sand beaches and amazing sunsets. Located just one block up the hill from the main marinas on White Lake, the Cocoa Cottage is the perfect respite after a long day on the water. Or, enjoy the water from the beach side. Within a few mile drive enjoy Meinert Park Beach or the White River Light Station beach, two of the most beautiful pristine beaches available for sun and sand lovers. After your time in the sun, you can enjoy the White River Light Station Museum and savor the rich maritime history of this unique lighthouse museum; which still has its original Fresnel lens, still intact. Do you want to captain your own ship? Rent a boat locally for a day or a week and sail White Lake or Lake Michigan. Of course, charter fishing and cruises are also available. Looking for a workout on the water? Take a short drive up the White River and rent a kayak or canoe. Then paddle back down river to beautiful White Lake. On the water, at the water, or in the water, White Lake and the Cocoa Cottage Bed and Breakfast offer it all. Indoors or out, the Cocoa Cottage Bed and Breakfast offers beautiful, unique spaces for an intimate wedding that will take your breath away. The services of an experienced, professional wedding and event planner is included in your wedding package. Custom-designed invitations, floral decorations and most of the amenities to make your exchange of vows memorable and complete are also included in your package. Relax and enjoy a sophisticated setting where you and your guests will feel special and pampered. We LOVE food: reading about food, cooking food, eating food and most of all sharing what we create. 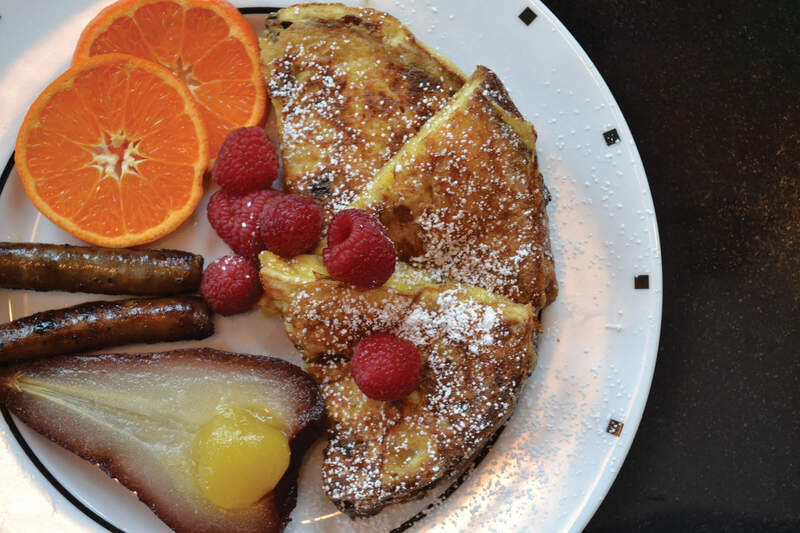 Cocoa Cottage Bed and Breakfast serves fresh, local and organic food. Whether it's our decadent chocolate desserts, award-winning breakfasts, picnic lunches, or a private "Table 223" experience, you won't be disappointed. Within walking distance we have a farmers market and fine dining, ice cream parlors and a craft brewery. If you want to get closer to the earth there are several you-pick produce farms available. Enjoy Lakeside dining at Crosswinds, Lake's Edge, Buzz's or the Lakehouse. Hearthstone Bistro and CF Prime are local favorites. Love fish? If your trip falls between Memorial Day and Labor Day, Bortell's Fisheries in Pentwater is a unique one-of-a-kind experience that should not be missed.